A grease trap (also known as a grease interceptor, grease arrestor or food and oil interceptor) is a holding tank with a number of baffles. It is specifically designed to slow the flow of warm/hot greasy waste water from commercial kitchens and food preparation areas allowing the waste water to cool. As the water cools , suspended fats, oil and grease from day to day cooking separate and float to the top, solids settle on the bottom and the cleaner and cooler water is discharged to sewer. The floating fats, oil and grease and the settled food solid will accumulate over time. This means your grease trap will need to be pumped out at regular intervals by a licensed trade waste collection contractor. The frequency may range from several weeks to several months. The licensed contractor will use a suction pump to remove all of the contents and wash and scrape the walls and baffles of the grease trap. Installing a larger grease trap may reduce the frequency and ongoing cost of pump outs. Which businesses require a grease trap? Retail food business that cook or serve hot food will need to install a grease trap. Waste water from food preparation areas, floor wastes, kitchen sinks, dishwashers and garbage areas should all flow into the grease trap. Why does my business need a grease trap? By law, local water authorities require that all fats, oils and grease from all commercial food preparation businesses must not be discharged to the sewer system. A grease trap is required to prevent most fats, oils and grease from entering the sewer system where they can solidify and build up to cause blockages, overflows or overload waste water treatment plants. It is also important to prevent hot liquids from entering a plastic (PVC) sewer system. The pipes can melt and buckle if the waste water discharged to sewer is too hot. Does your grease trap need to be an approved design? Water authorities throughout Australia set the design specifications for grease traps. 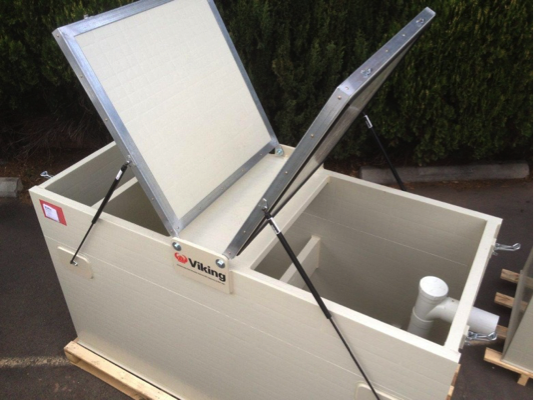 Viking Plastics’ grease traps are approved for use in virtually all regions of Australia. We will supply the correctly designed grease trap for your particular locality. For a list of local water authorities, click here. Who is my local water authority? In some large metropolitan cities it is the water supply companies. In other areas, especially rural areas, it is usually the local council. In Melbourne trade waste is governed by City West Water, South East Water and Yarra Valley Water. In Sydney it is Sydney Water. In Brisbane it is the Brisbane City Council. On the Gold Coast it is the Gold Coast council. Likewise on the Sunshine Coast, the city council is responsible. In Adelaide trade waste is governed by SA Water which covers the whole state. Water Corporation governs Western Australia. Your local water authority will have a set of sizing criteria to establish the capacity applicable to your application. Often there is a combination of methods to determine the correct capacity. The first method is based upon the seating capacity of a restaurant or establishment. Naturally, the more seats the larger the grease trap capacity. The second method is to add up the litre allowance for each appliance or fixture in the food preparation area. The larger figure from these two methods is used to establish the required capacity. Other special rules may apply. For example, Sydney Water has set the minimum grease trap capacity at 1,000 litres. Fast food outlets often require larger capacity grease traps. The floating fats, oil and grease and the settled food solid will accumulate over time. This means your grease trap will need to be pumped out at regular intervals by a licensed trade waste collection contractor. The licensed contractor will use a suction pump to remove all of the contents and wash and scrape the walls and baffles of the grease trap. 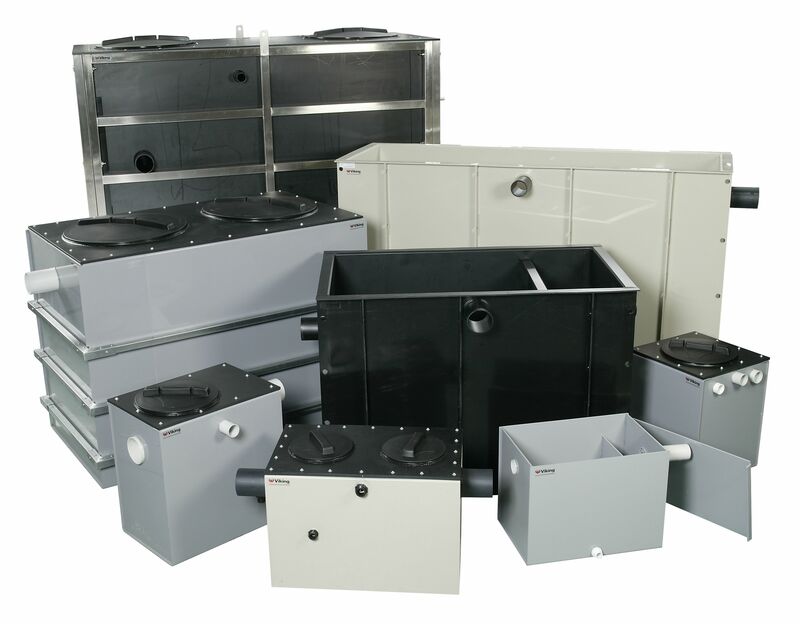 The frequency of cleaning will be set in your trade waste agreement and will depend upon the capacity of the grease trap and your type of business. The frequency may range from several weeks to several months. Installing a larger grease trap will reduce the frequency and ongoing cost of pump outs. Who can install a grease trap? A grease trap must be installed by a licensed plumber. They will be able to advise you on the best hydraulic design, venting and backflow prevention. They will also need to supply a Certificate of Compliance for their work, which will be required by the local water authority. Can I install an above ground grease trap? Yes, grease traps can be installed either above or below ground depending upon the circumstances of your location. However, you need to be aware that if the grease trap is located above the waste water collection point, a pump tank will be required to pump the waste water up to the grease trap. Your first preference should be to drain the waste water by gravity to the grease trap and then by gravity out to sewer. This avoids any maintenance issues associated with a pump unit. What tank options are available? 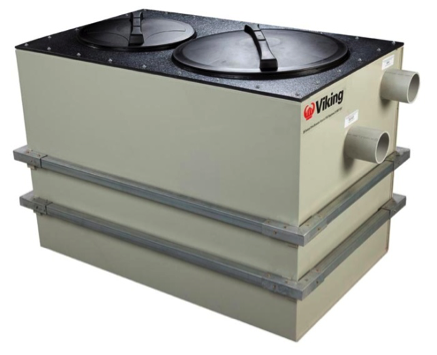 Viking Plastics offers are choice of construction types – thin skin tanks or Paneltim® tanks. Paneltim® is an innovative 50mm thick, dual skin sandwich panel with an internal cross-rib- cell structure that is lightweight yet offers superior strength and rigidity in both length and width. Larger above ground tanks (2000 litres and above) are typically more economical when constructed from Paneltim®. Paneltim® below ground tanks are a cost competitive alternative to thin skin tanks as they offer faster and lower cost below ground installation due to the superior strength and rigidity of Paneltim® that avoids the need for poured concrete reinforcement. Above ground grease trap with screw-in lids. Above ground grease trap with hinged lids. When using Paneltim® construction for above ground tanks, there is a choice of circular screw-in air-tight lids or hinged lids which provide much better access for easier cleaning. Hinged lids come with gas struts to support the lid when open and toggle clamps to ensure an air-tight seal when closed.